I ABSOLUTLEY HAVE TO READ THIS BOOK. I’m a big fan of Michael Lewis’s books (Moneybag, The Big Short, The New New Thing) and if you haven’t seen me quoting and citing Daniel Kahneman’s and Amos Tversky’s work from Thinking Fast & Slow about how our intuitions can mislead us you’re not reading anything I write. A Friendship That Changed Our Minds Hardcover, 362 pages | We like to think our brains can make rational decisions – but maybe they can’t. The way risks are presented can change the way we respond, says best-selling author Michael Lewis. 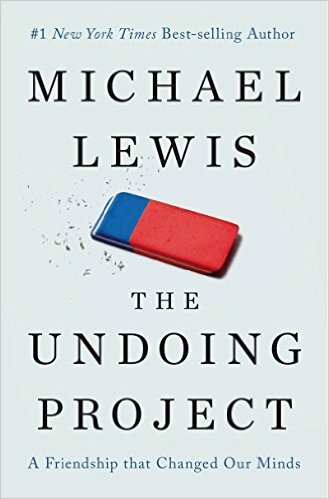 I was hoping that Michael Lewis’s new book, The Undoing Project: A Friendship That Changed Our Minds, would offer up a bit of post-election escapism. In the book, which is published by W.W. Norton & Company and came out today, Lewis tells the story of Danny Kahneman and Amos Tversky, two Israeli psychologists whose friendship and collaboration changed the way we look at human behavior forever. News Corp is a network of leading companies in the worlds of diversified media, news, education, and information services. ‘The Undoing Project,’ focuses on the lifelong collaboration of Daniel Kahneman and Amos Tversky, two Israeli-American psychologists who are our age’s apostles of doubt about human reason. The research of Kahneman and Tversky has become some of the most influential social science of the past century. It has helped to reorder economics by exposing the folly of economists’ belief in an unconsciously rational human mind. The work has also led to advances in medical diagnosis and patient behavior.